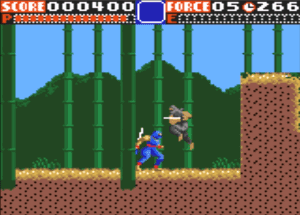 This Game Gear version of Ninja Gaiden was released a year into the systems life and was developed by Biox with license from Tecmo. Once again you play the role of Ryu Hayabusa who is out for revenge on Shiragane and his evil organisation after they attempt to steal your Dragon Sword. If you're expecting this to be similar to the NES games prepare to be disappointed. The franchise is known for its speed, difficulty and tricky platforming, yet this Game Gear version feels like a completely different series rather than a watered down Ninja Gaiden title. The majority of the games' five levels are surprisingly short and easy (even on your first play-through) and you can be reckless with your actions while still progressing with little challenge. There's tons of health scattered around the levels and it takes many hits to actually lose a life. I've heard some people say this game is more in-line with Sega's slower paced, action-oriented Shinobi series and I think that's an accurate comparison. There are a few power-ups you can obtain but you'll rarely need to use them due to how quickly you can repeatedly sword slash while pushing forward. There are some nice cutscenes between stages though and while they're a little bit cheesy they do help to pull you into the story. The bosses are varied and can pose a nice challenge until you figure out their attack patterns. The final boss features impressively large sprites throughout his three different transformations and while he's not too difficult to defeat it's quite intense due to the short timer you're up against. The only thing I don't like about these battles is that if you die you're sent back to the very start of the level; the lack of checkpoints is annoying but considering this is already a very short game it's somewhat understandable. The graphics are outstanding (especially for an early Game Gear title) and each act is full of colour and texture detail. The controls are tight and responsive but it's strange that the developers mapped the special item button to Down + Attack instead of the usual Up + Attack. The music is excellent but tends to become very samey. There's also a glitch in Act 5 whereby the track cuts out for a few seconds before looping back to the start. Newcomers to the Ninja Gaiden franchise might find some enjoyment in this Game Gear version due to its decent controls and smooth gameplay. However, veterans will likely find that it deviates too far from its predecessors and once you've beaten the game there's very little reason to return to it. Random trivia: While Biox aren't the most well-known developer they did work on a number of high-profile titles including Mega Man II (Game Boy, 1991) and Streets of Rage II (Master System, 1993).